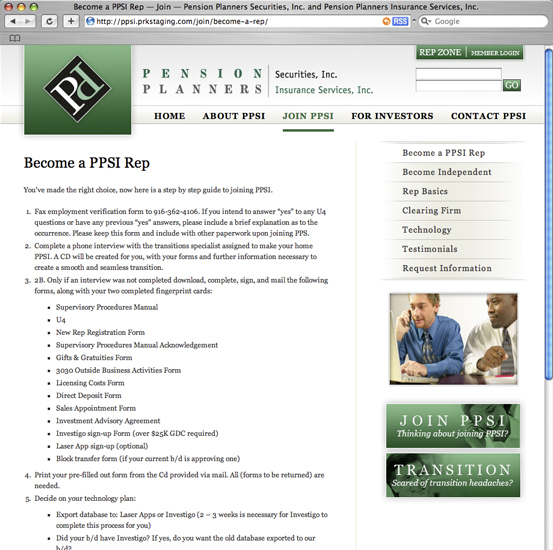 Pension Planners Securities, Inc., 2007 Web Site Redesign — PRK Kreative Portfolio | Responsible web site design, development, and marketing. Pension Planners Securities, Inc. approached PRK Kreative to help make their original Flash site more user friendly and to simplify content management. We stepped in and designed a fresh new template and replaced their Flash site with search engine friendly, standards compliant templates. On the backend we built a custom module for our BodhiCMS to make user management a breeze. Using the custom module Pension Planners, Inc. is able to manage a secure "RepZone" for over 200 Registered Representatives.